BEAM Vibrobots use pager motors to move. 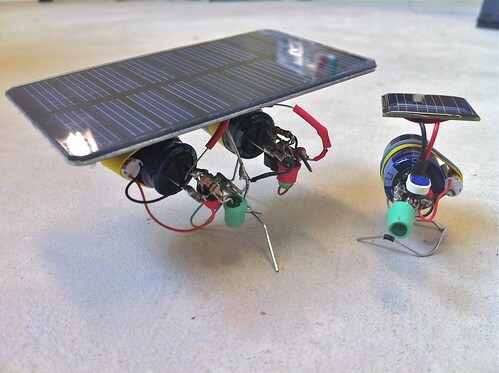 I used what’s known as a BEAM “solar engine” (Type 1 “FLED” variety), pager motors, solar cells, paperclips, and some heat shrink to build a couple of Vibrobots this weekend. Tagged BEAM, Dual Vibrobot, electronic reuse, heat shrink, Pager motors, paperclip robot, recycled electronics, recycled pager motors, robot, solar BEAM bot, solar robot, vibrating robot, Vibrobot. Bookmark the permalink.